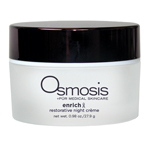 Enrobe stressed, aging skin with this restorative night cream! Nourishing botanicals, fruit oils, and natural humectants deliver moisture deep into the skin, restoring the lipid barrier for an effortlessly luminous and supple complexion. Achieve immediate, revitalizing and volumizing benefits after each use. Water (Aqua), Phosphatidylcholine, Glycerin, Ethyl Macadamiate, Prunus Armeniaca Kernel Oil, Coco-Caprylate/Caprate, Maltodextrin, Butyrospermum Parkii (Shea Butter), Rubus Idaeus Seed Oil, Sodium Stearoyl Glutamate, Hydroxypropyl Starch Phosphate, Cholesteryl Oleyl Carbonate, Rosa Canina Fruit Oil*, Citrus Aurantium Bergamia Fruit Oil*, Mangostin, Terminalia Ferdinandiana Fruit Extract, Swertia Chirata Leaf Extract, Sambucus Nigra Flower Extract, Vaccinium Angustifolium Fruit Extract, Chamomilla Recutita Flower Extract, Sodium Hyaluronate, Linum Usitatissimum Seed Oil, Aniba Rosodora Wood Oil, Prunus Amygdalus Dulcis Oil, Cholesteryl Chloride, Cholesteryl Nonanoate, Tocopherol, Ascorbyl Palmitate, Citrus Limon Peel Oil, Ricinus Communis Seed Oil, Leuconostoc/Radish Root Ferment Filtrate, Hydrogenated Castor Oil, Alcohol, Xanthan Gum, Sodium Gluconate, Cetyl Alcohol, Stearyl Alcohol, Caprylhydroxamic Acid, Alcohol Denat., Benzyl Alcohol.